The 300 Weatherby Magnum was introduced around 1946 and it is still the most popular magnum that Weatherby ever made. This cartridge is loaded to 65,000 cup and its recoil is quite serious. The 300 Weatherby Mag will really get your attention the first time you shoot one. This cartridge has far more recoil than a 300 Winchester Magnum. It also has enough power to hunt almost any big game animal in the world. However, some countries don't allow 30 caliber bullets to be used on certain big game animals. When loading the 300 Weatherby Mag, I prefer to make near maximum handloads using 180 - 200 grain bullets, Weatherby brass, and some of the slowest burning Hodgdon powders. For custom rifles that are not freebored, maximum loads should be reduced by an extra 5%. Even then, they should be approached with caution. Weatherby recommends using magnum primers. The main problem with handloading the 300 Weatherby Mag is case expansion that occurs at the pressure ring "just above" the belt. Conventional resizing dies can't properly resize any belted magnum case in this area. These cases soon develop a slight "bulge" around the case (usually after just 2 or 3 firings). When that happens, these cases will begin to stick in your chamber or they will fail to chamber at all. This is a very common symptom when reloading belted magnum calibers. Handloading the 300 Weatherby Mag with our Belted Magnum Collet Resizing Die will increase the life of your cases and insure a perfect fit in your chamber. "Finally a resizing die that works on belted magnum cases." This unique collet resizing die solves this common reloading problem and has several patented features. The top of the die serves as a case width gauge to show when "complete" case resizing is required. This resizing die is used to eliminate the case "bulge" after using your full length or neck sizing die. This die insures that your belted handloads will always chamber properly. Now your cases are able to last for up to 20 firings, even when using hot loads. This resizing die uses a collet that fits over the cartridge case, until it bottoms against the belt. The case is then pressed into the sizing die. The collet allows your case to go farther into the die where it only reduces the area "just above" the belt. This ONE die and collet is universal and works on ALL of the popular belted magnum calibers including: .257 Weatherby Magnum, 6.5 Remington Magnum, .264 Winchester Magnum, .270 Weatherby Magnum, 7 x 61 Sharpe & Hart, 7mm Remington Magnum, 7mm Weatherby Magnum, 7mm STW, .300 H & H Magnum, .300 Win Mag, .300 Weatherby Mag, .308 Norma Magnum, 8mm Remington Magnum, .338 Winchester Magnum, .340 Weatherby Magnum, .350 Remington Magnum, .358 Norma Magnum, .375 H & H Magnum, .416 Remington Magnum, . 458 Winchester magnum and several wildcat cartridges. There are no extra collets to buy when resizing any of these calibers. This unique Belted Magnum Collet Resizing Die is made only by Innovative Technologies. 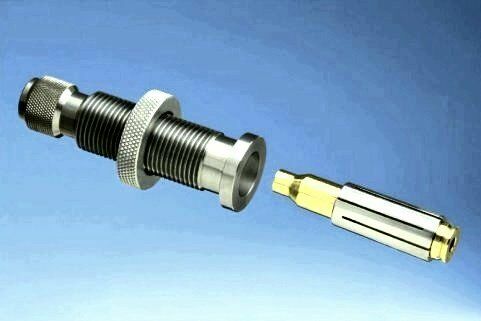 At this time, our collet die is only available from this website.